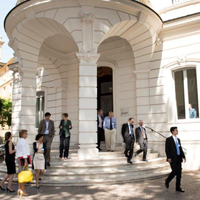 The Einaudi Institute for Economics and Finance produces world-class research, with an emphasis on policy relevant topics. It also aims to improve the quality of higher education in economics and finance in Italy by organizing advanced graduate level courses, high-quality seminars and conferences. The Einaudi Institute for Economics and Finance (EIEF) is an independent research institute, created in 2008 by the Bank of Italy. EIEF realizes the idea, formulated in the mid ‘90 by Carlo Azeglio Ciampi, then President of EIEF’s predecessor, the Ente Luigi Einaudi, of transforming the latter into a center with resident researchers, producing frontier research and high quality training. EIEF produces world-class research in economics and finance, generates ideas which are useful in the policy debate, and creates an environment that can help reverse Italy’s “brain drain” by both attracting strong foreign scholars and inducing the best Italian scholars trained abroad to return to Italy. EIEF also aims to strenghten higher education in Italy co-operating with Italian universities, with a focus on graduate research-oriented courses and on supervision of selected PhD students. EIEF offers a working environment that adopts the standards of, and strives to be competitive with, the best international academic institutions. The result is an intellectually rich and dynamic environment, free from many of the bureaucratic constraints that burden the Italian academia, able to pay competitive salaries, strictly meritocratic in its selection criteria, and strongly research oriented. EIEF is ruled by a Governing Board that includes three internationally renowned academics - Marco Pagano (University of Naples, Federico II), who is also the President, Roland Bénabou (Princeton University) and Monika Piazzesi (Stanford University) - and two representatives of the Bank - Salvatore Rossi, Deputy Governor, and Paolo Angelini, Deputy Head of the Directorate General for Financial Supervision and Regulation. The Board provides strategic input to the research agenda of the Institute, monitors the output of the research activity, and enforces the highest quality standards. The President liaises with the Director, Daniele Terlizzese (Bank of Italy), and together they run the Institute. A key ingredient in achieving the stated goal of competing with the best international academic institutions is the hiring of talents in the same market. Since its creation, EIEF has therefore chosen to recruit its younger researchers, the Assistant Professors, on the international job market for economists. The job market takes place every year in a different US city which hosts the annual meetings of the American Economic Association. The choice to recruit on this market clearly signals the will to compete in the global market of talents. The junior researchers are hired as Assistant Professors, with contracts similar to those offered by the international academia. They are full-time, tenure track contracts, lasting 8 years (with a mid-term assessment). The contracts can be converted into permanent ones at the end of the 8-year period on the basis of a positive evaluation of the researchers’ publications and of their contribution to the intellectual life of the Institute. Tenure decisions are highly selective, and involve at least 6 external reviewers with sterling international reputations who write letters to assess the scientific production of the candidate. The group of full-time senior researchers is composed of the Assistant Professors who have obtained the tenure or direct hirings, with different levels of seniority (Associate and Full Professors), from the international academia. Some of the senior positions are partially funded by private donors or institutions as entitled Chairs or by Grants awarded by the European Research Council to finance specific research projects. The team of resident researchers is complemented by Fellows and Research Affiliates, academics of sterling international reputations working in Italian or foreign universities, who cooperate with EIEF on a part-time basis, producing research and contributing to the pursuit of the Institute’s mission. Finally, the intellectual life of the Institute is also enriched by the Visiting Professors, well known senior and junior scholars, typically working in a foreign university, who spend shorter periods of time - from a few weeks to a whole academic year - at the Institute. Their presence offers researchers at EIEF a unique opportunity to work with or discuss their work with some of the world’s top economists. At the same time, visitors can trigger virtuous interactions with the wider economic and financial community, including policy-makers. 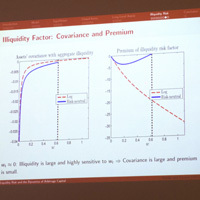 EIEF hosts two formal weekly seminars, one focused more on macro/theory and the other more on applied/empirical economics, and a less regular series of brown-bag seminars. 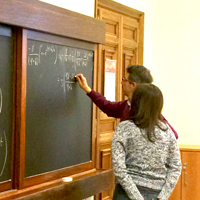 The Institute has improved the quality of Ph.D. programs of Italian universities, by offering research oriented courses that enrich their basic curricula (200 to 250 hours of lessons per quarter) and by giving Ph.D. students the possibility to make contact with researchers who are actively working at the frontier of knowledge. In September 2017 EIEF launched a new Master’s program: the Rome Masters in Economics (RoME), which is addressed to a small group of highly talented students; it aims at competing with the best Master’s programs in Europe. This project is carried out in cooperation with LUISS university. The Institute maintains close links with the Bank of Italy and its highly qualified research staff. The relationship with the Italian central bank provides researchers at EIEF with both an opportunity to influence policymaking and a challenge to address substantive policy issues in their work. The Institute offers grants for research projects in Economics and Finance. From 2008 to 2012 EIEF also offered scholarships to finance graduate studies abroad but in 2013 the scholarships program was suspended. 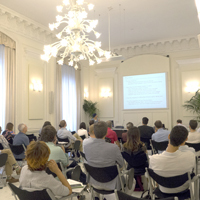 EIEF offers a pleasant and stimulating environment that is very congenial for researchers, excellent research facilities and beautiful premises located in the center of Rome, in Via Sallustiana, 62 (near Via Veneto), with abundant office space and brand-new facilities.